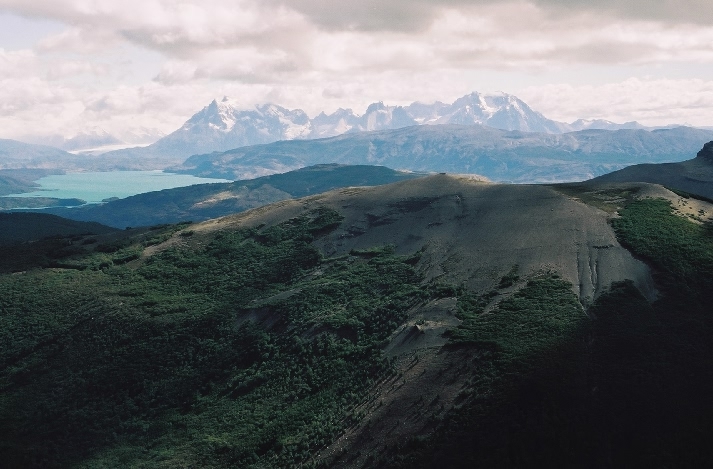 Today’s photo is of the famous Paine Massif in Chilean Patagonia off in the distance. This granitoid laccolith complex intruded into the Cretaceous sedimentary rock in the Miocene (some researchers have interpreted this as a response to ridge subduction…more on that in the future). Quaternary glaciation has carved these rocks into spectacular towers and rugged peaks that people from around the world come to visit. If you look to the left of the highest peaks you can see Glacier Grey coming off the Patagonian ice sheet. Parque Nacional Torres del Paine is becoming the trekker’s destination. This photo was taken from the top of a mountain 30-40 km to the south while we were collecting data. Being able to go places that no one else goes and getting views no one else gets is one of the greatest aspects of field geology. It’s not that people couldn’t have gone here, they just don’t. I suppose it’s understandable … if you travel all that way and don’t have tons of time, you’d probably rather see this up close. Stay tuned for some posts chronicling my travels in the area. Maybe not as exciting as Alessia’s recent adventures in Antarctica, but I’ll have a few stories to share. That is a glorious landscape. There are so many places I haven’t been, and I am beginning to feel like time is ticking away far too fast. Enjoy your journey! That looks incredible. Amazing vistas.